Sawn Rainbow Stone Steps are our popular Rainbow stone with sawn tops and bottoms and natural edges. The interior color of rainbow is spectacular - with an incredible mix of colors and grains. It can almost look like is was formed by something molten the waves and patterns in the stone look like flowing lava. 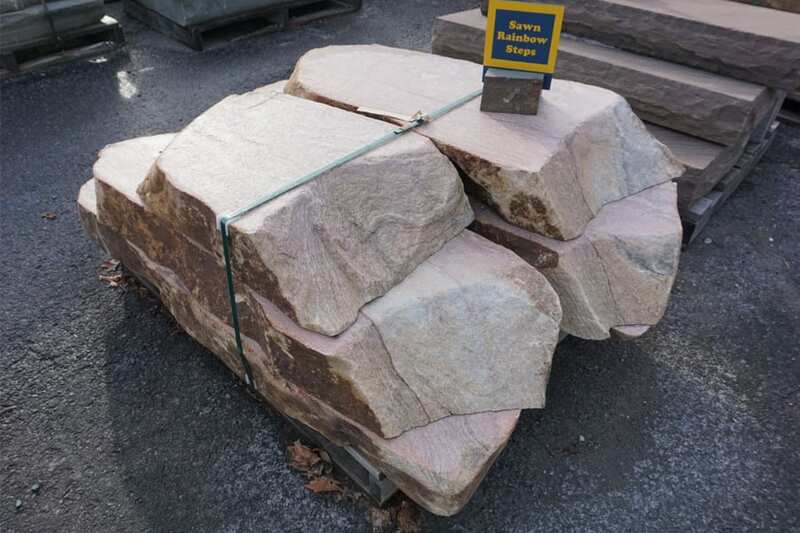 Often cut from a single bolder Sawn Rainbow Stone Steps can have a wide range of sizes and some really unique shapes. 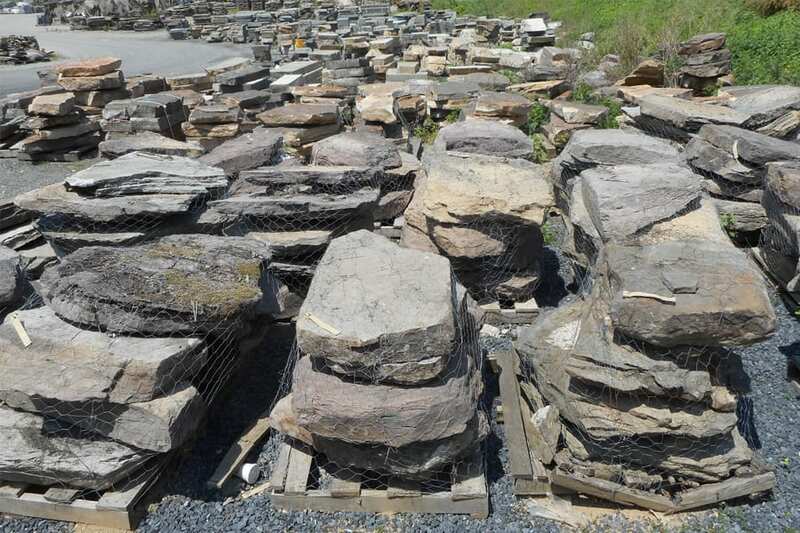 Please stop by to see our full selection of Natural Stone Steps. Pieces are sawn from a single boulder to stunning effect. These are exceptionally beautiful and unique natural stone steps. Sawn surfaces are smooth but not slippery. Not easy to describe. 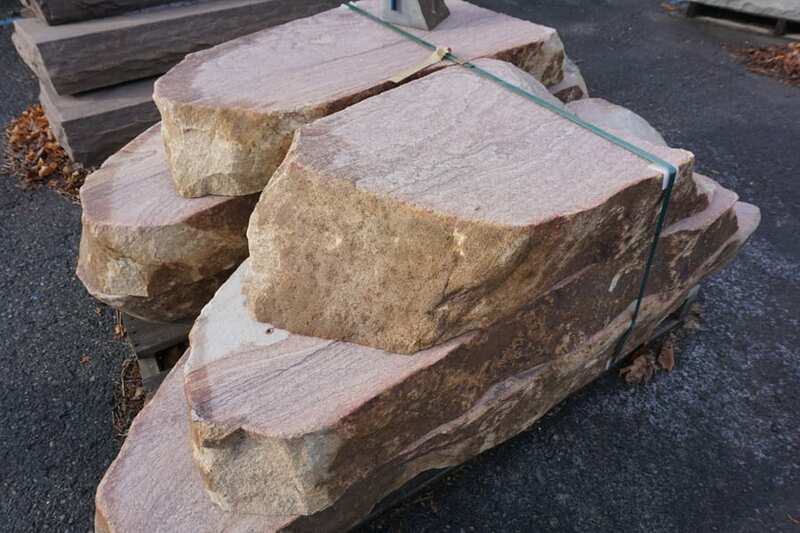 Rainbow boulders - the stock that these steps are sawn from is naturally orange, rust, salmon and deep brown to black on the outside so the edges of these steps will be some combination of those colors. However, when you cut the stone the inside colors are more muted and there is intense graining in the colors. Really have to be seen to be appreciated - they are striking. Completely natural edges are highly irregular, top surfaces are sawn so they are smooth but not slippery. Steps are sawn to 6" riser heights. Length and width are highly variable and depend on the set. It is not uncommon for each step in a set to be 3-4 feet wide, 2 - 3 feet deep, and 6" tall, but that can vary widely. By the total square feet of step surface area. Each step is measured at the saw house and pallets are marked with total square footage of all pieces on the pallet. You can see how colorful and intense the grain is on the inside of the stone.